Pediatricians and safety experts have long advised parents to place their small children in rear-facing seats when they ride in the car. While research shows that children are safer in front- or side-impact crashes when in a rear-facing position, questions remained about whether riding in a rear-facing seat could cause a greater risk of head trauma when the car was involved in a rear-end crash. A new study shows the safety of rear-facing seats, even in rear-end crashes. Read on to learn more about the study, and contact a knowledgeable Vancouver personal injury lawyer if your or your child has been injured in an accident. Experts tout the safety of rear-facing seats due to their ability to distribute the force of impact from a crash, but research was lacking on whether impact-distribution of a rear-facing seat occurred as well in rear-end crashes as it did front- or side- impact crashes. The recent study on rear-facing seats was conducted at the Injury Biomechanics Research Center at Ohio State University. The researchers used four common models of rear-facing car seat in laboratory-simulated rear-end car crashes. Their goal was to learn whether a rear-facing seat could cause a child’s head to strike the rear of the car’s front seats in a rear-end crash, causing injury to the head or neck. The lead author in the study, Julie Mansfield, reported that the rear-facing seats did a good job at keeping the seat occupant’s head, neck, and spine in alignment. “With a rear impact, we would expect occupants to be ‘pulled’ toward the rear of the vehicle according to basic physics,” Mansfield explained. “When a child is in a rear-facing carseat in this scenario, the car seat actually stays with the child and continues to support the head and spine.” Mansfield also explained that, even when the seat rotated upward, the occupant remained safely cradled in the shell of the seat, and the child seat and car’s seat interacted to distribute force into the car’s soft seat rather than into the child. 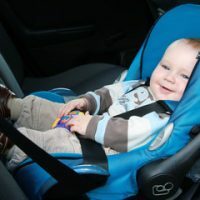 Washington state does not require that children ride in rear-facing seats; the law states only that children under eight years old must ride in a child safety restraint, and that children under age 13 ride in the back seat when in the car. That said, Washington transportation safety officials do recommend that parents use rear-facing seats until an infant is at least two years of age, even though this isn’t mandated by law. Oregon law, in contrast, does require the use of a rear facing seat. Any infant under two years of age must be placed in a rear-facing seat under the state’s law, unless the child reached one year of age on or before May 26, 2017. If your child has been injured in a car accident in Washington or Oregon, contact the dedicated and seasoned Vancouver personal injury attorney John Lutgens for a free consultation at 360-693-2119, serving all of Southwest Washington and Portland. © 2016 - 2019 John Lutgens, Attorney at Law. All rights reserved.